The photo above shows preference settings on the Calendar app. 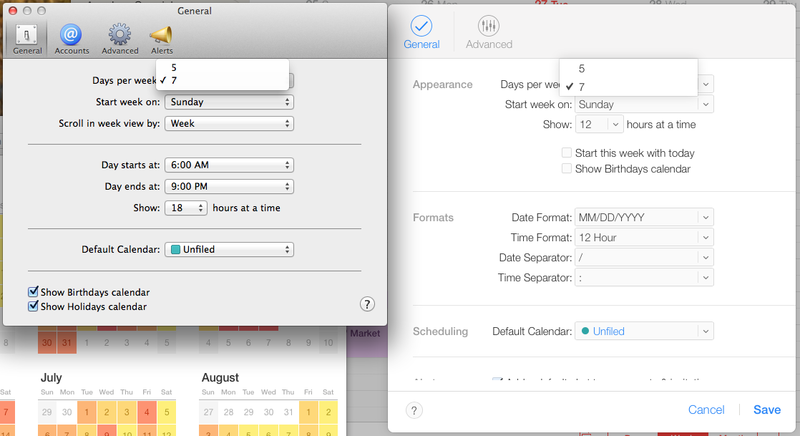 On the left is the Calendar app from OS X 10.9 (Mavericks). On the right is the iCloud Calendar app’s preferences. Initially, I thought iCloud apps were going to look more like their iPad brethren on iOS 7. The iWork apps, certainly, take a lot of inspiration from the iPad versions. But the utility apps (Calendar, Contacts, Notes, Reminders, and Mail) certainly look more like OS X, with complex dialogs with Save and Cancel buttons in the lower right. Mail preferences, for example, on both iCloud and OS X look a lot alike in terms of their layout (tabs on the top, attributes in the middle, help button on the bottom)–but their look and feel (fonts, colors, graphics) are significantly different. The iCloud versions may not look exactly like what the final version of OS X 10.10 will look like, but I’ll bet they’ll be very, very similar. What look is that? Just like the transition from iOS 6 to iOS 7, the transition from OS X 10.9 to 10.10 is much flatter: the tab icons at the top of the dialog go from photorealistic with drop shadows and gradients to simple, very thin line art with only color to suggest selection status. The typeface is much thinner and airier (Helvetica Neue?) and the popup menus are much flatter. I dare say the popup menus, buttons, and other controls are tall enough to be … tappable. Perhaps Apple is preparing OS X 10.10 for use on hybrid (eek!) devices, in other words laptops with touch screens or tablets with keyboards? Perhaps Apple is readying a set of OS X 10.10 controls that are compatible with equivalent iOS controls, making it easier to port iOS apps to OS X? Note the lack of radio buttons, which don’t exist as controls on iOS, in the iCloud app settings dialogs. I will say the new look is fresh without being quite as stark as the transition from iOS 6 to 7. Or maybe I’ve finally gotten used to 7. The Mail app’s settings from OS X 10.9 on the left, and iCloud on the right. → Will Apple make universal apps work on iOS and OS X? Good observation. If that is the case, I don’t like it, too hard to read. The iCloud prefs do seem nicer, with a smarter layout than the OS X prefs. The only problem is that the iCloud prefs are too low in contrast, making them more difficult to read and use. If Apple increased the contrast on this new layout, it would definitely be an improvement. Hopefully OS X 10.10 has the same options as iOS 7, in terms of increasing contrast in the Settings. I can’t view your site without using proxy. Why are you blocking Philippines? Do you have anything against my country? Sorry to hear that. It’s just WordPress.com; I’m not doing anything special. I can’t tell if it is a matter of what I’m used to seeing versus what is new, however this article is further consolidating my feeling that Mr. Ive is prioritizing fashion over functionality. I for one am sad about this. Mr. Ive, your hardware designs are second to none. Your GUI design, not so much. For the first time since I came into contact with Apple devices, the Mac & iOS UI are becoming unintuitive, unfamiliar and incomprehensible (I never needed to ask myself: what does this icon mean). And it is a big déjà-vu: trying to work with Android feels confusing in the same way. The Apple UI was easy because it came so natural and all apps gave the same user experience. You just knew what to expect. Ive, stop grinding your axe, wherever this leads to. You also need to think about the families with several generations of iOS en OSX devices in the house. They all have different UIs !!! If the fonts used in Apple’s “new, improved” interface design get any fainter or any thinner, they will disappear altogether! Not bad, but if the new system font is Helvetica Neue, it may be too thin for some people to read. I hope Apple would at least offer an option for higher-contrast, easily-readable fonts. Also, the loss of button borders do not bother me, but I know it would confuse newbies. Hopefully there will be an option similar to iOS, but less ugly. Looking forward to what Apple has up their sleeves for 10.10 (or Mac OS 11, OS XI, or even Macintosh System 11, haha joking) next week at WWDC! When iOS7 was released the font was too thin for my 54 yr old eyes to read. Luckily there was a bold text setting in General/Accessibility that fixed it. I told everyone about it and they all changed it. Then when I updated to 7.1 my text was so bold it looked terrible. I had to go back in and turn that off and it went back to looking just like 7.0 with bold text on. Apple obviously got the hint and fixed it in a relatively short time. I’m sure they learned a lesson and will make it right in OSX 10.10.